Large Cap Stock - What Does It Mean? What is a "large cap stock"? What is the definition of the term "large cap stock"? A large cap stock is any stock that has a total valuation of at least $10 billion and less than $200 billion. 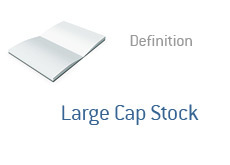 To find out whether or not a stock qualifies as a "large cap", simply look up their "market cap" on a site like Yahoo! Finance or Google Finance. "Market cap" is the total valuation of the company - to find the market cap of a company, simply multiply their total shares outstanding by the current market price of one single share in the company. All three of these companies would qualify as "large caps".